Ben Nicholson’s work has come to be seen as the quintessence of British modernism. His austere geometric paintings and reliefs are among some of the most influential abstract works in British art. Ben Nicholson was born in Denham, Buckinghamshire in 1894. Both his parents were artists, one the brilliant poster designer Sir William Nicholson. Nicholson studied at the Slade School and then travelled widely in Europe and the United States for a few years. In 1920 Nicholson married the artist Winifred Roberts. Nicholson’s early work consists of delicately worked still lifes, which show the influence of his father. In the 1920’s he began painting figurative and abstract works inspired by Post Impressionism and Cubism, which he had seen whilst travelling. His first one-man show was at the Adelphi Gallery in 1921. In 1931, Nicholson’s relationship with the sculptor Barbara Hepworth resulted in the breakdown of his marriage to Winifred. In 1932 he visited Paris with Hepworth and met Picasso, Braque, Brancusi and Arp. On Subsequent visits to Paris in 1933 and 1934 they met Mondrian and Moholy-Nagy. Jean Helion encouraged him to join Abstraction-Creation in 1933. His “Au Chat Bottle”, 1932, reflects his contact with Braque, and his White Reliefs of 1933-8, which he carved, suggest the influence of both Hepworth and Mondrian. In 1937 he became editor of Circle, and from 1939 to 1958 lived in Cornwall with Barbara Hepworth, whom he married in 1938. His later work moved regularly between abstraction and figuration, always with cool, harmonious colours, subtle textures and precise interlocking shapes. 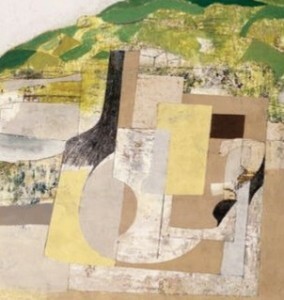 In 1945/46 he moved from reliefs to linear, abstract paintings. Nicholson was commissioned to paint a mural for the Time-Life Building in London in 1952. In 1954 he was given retrospectives at the Venice Biennale and at the Tate Gallery, London, and in 1955 the Stedelijk Museum, Amsterdam. In 1958 he married for a third time and moved to Ticino in Switzerland. He eventually moved back to London where he died in February 1982.